Remember the patent news of an iMac Touch and Macbook Touch? How about the Apple job posting that referred to a revolutionary feature in Mac OS X 10.7? Is it possible all of these things are tied to each other? 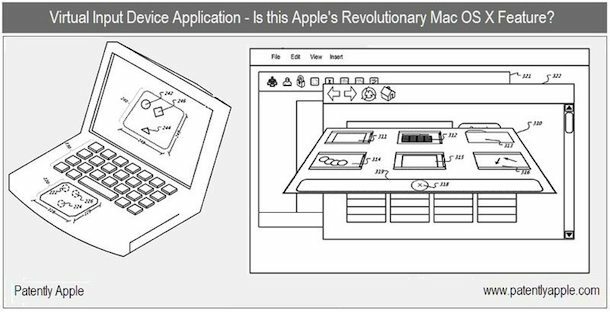 The same site that dug up the first two patents has uncovered another interesting Apple patent, this one referring to a “Virtual Input Device Application” that, well, basically creates a virtual input device on a touch screen. The technology will somehow allow you to project an input device into the display of the unit that could then be used instead of the physical input device. For instance, a physical touchpad could be created virtually on your display and then used as you would your physical trackpad. This virtual input would apparently work in either 2d or 3d representations, and could shift from a two-dimensional to a three-dimensional object based on user input. A more simple version of a ‘virtual input device’ could be something like the iPhone and iPad keyboard, which appears as a virtual keyboard and is activated through touch response. So what does this have to do with Mac OS X 10.7 and cloud computing? PatentlyApple speculates that this could be the ‘revolutionary’ feature that Apple is apparently working on for future Mac OS X versions. This would indeed be a nice feature to include in Mac OS X, and it makes sense considering the iMac Touch patent specifically mentions Mac OS X seamlessly switching into the touch-based iOS. I originally speculated that based on information from the job posting, the ‘revolutionary’ feature is somehow related to cloud computing. I still think that is true considering the heavy HTTP emphasis in the job requirements, plus the massive data center that Apple has built to support who knows what. Perhaps an upcoming version of Mac OS X includes iOS itself, and syncs data and apps seamlessly with your other iOS devices through the cloud? Wouldn’t that be neat? 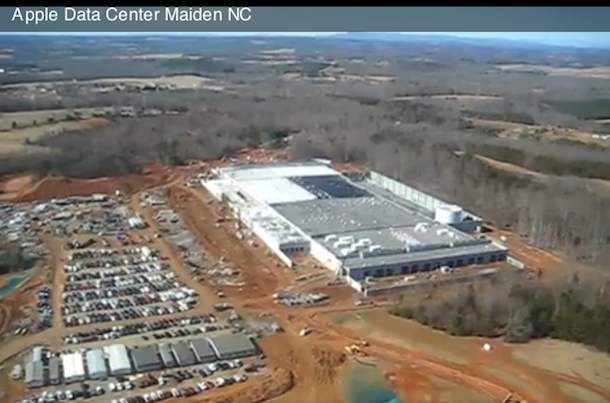 That would explain the touch emphasis, virtual inputs, and the humongous data center that Apple has built in North Carolina (pictured below) that would be ideal for cloud computing and storage. We’ll find out what Apple is up to sooner or later, until then we’re all left guessing. I see this as a virtual keyboard and virtual game controls, it’s already on so many iOS apps it wouldn’t be a big jump to bring it to a touch Mac. I would never want to have a touch iMac. Bringing touch to these devices normally brings down image quality. And I don’t like smudging my display. Why use touch when you have much more precise and quicker mouse and keyboard? Wonderful writing and definitely can assist with becoming familiar with the article much better.